I have always been in the art field and as you can see, love to share the joy of painting. That little girl really seemed to enjoy adding a few touches. In The Netherlands, I decorated store windows and did showcard lettering prior to arriving in the US. Once here, this experience soon evolved into graphic design and advertising art. Painting was pursued in art classes taught by Jay O’Meilia, A.W.S. and later, on a full-time basis under Frank Reilly, a popular instructor at the New York Art Students League. During that time in New York, I became one of the first painting workshop pioneers, organizing workshops taught by my idols, John Pike, Edgar A. Whitney, Robert E. Wood, Tom Hill, Milford Zornes and Rex Brandt. Over the years, these mentors became friends who inspired me to also paint and teach. Elected a Signature Member of the American Watercolor Society, my paintings and articles have been featured in Southwest Art, American Artist, Australian Artist and on the covers of the Artist’s Magazine and Watercolor Magic. 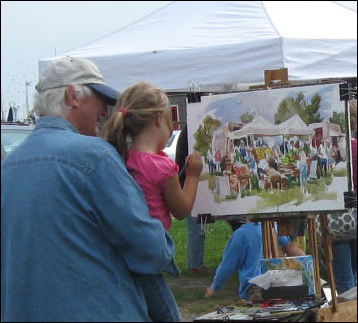 The first instruction book titled Outdoor Watercolor Workshop, was soon followed by two others, Painting With the White of Your Paper and The Watercolor Fix-it Book, both co-authored with fellow artist Judi Wagner. This last book introduced The Building Blocks of Painting. Since artists are visually oriented, a set of visual symbols were designed to serve as a graphic reminder of what to do and think about during the painting process. Later, used as a check list, these symbols help to analyze problems needing to be resolved. Since there are no “rules” in art, these guidelines are based on the experience passed down by generations of masters in every painting medium and style. The Watercolor fix-it Book and The Building Blocks of Painting DVD pictured below, explain this visual reminder system in detail.